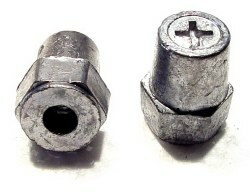 Stud to Top Post conversion connectors. Military specification battery post clamps. UPS Ground one day a week. QuickCable also calls these " Add On " connectors. Low profile design measures only 3/4" high. Long bolt permits additional power connections. it to an automotive top post configuration. Many deep cycle batteries come standard with threaded studs. Made of lead with a threaded steel insert. Currently we have 6 of the 3/8" on hand.